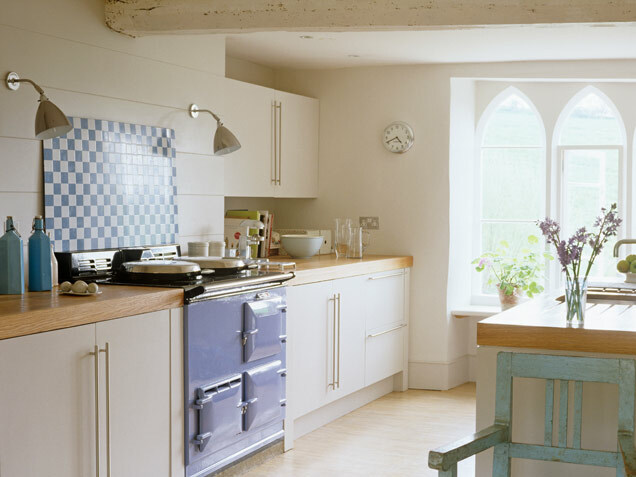 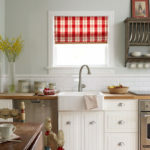 Cooking Light: Tall, gothic-style windows shine plenty of natural light on a cheerful checkered backsplash. 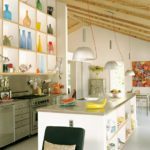 Weathered White: A neutral palette won’t fall flat with a mix of white wood surfaces, cream-colored ceramics and glass canisters. 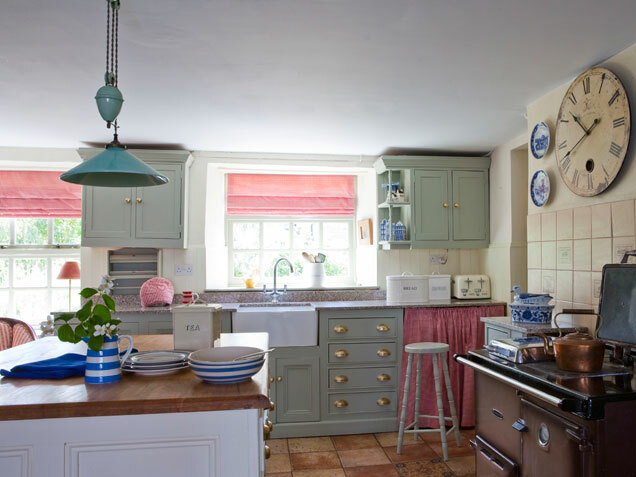 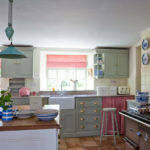 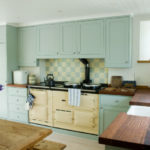 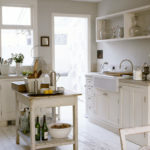 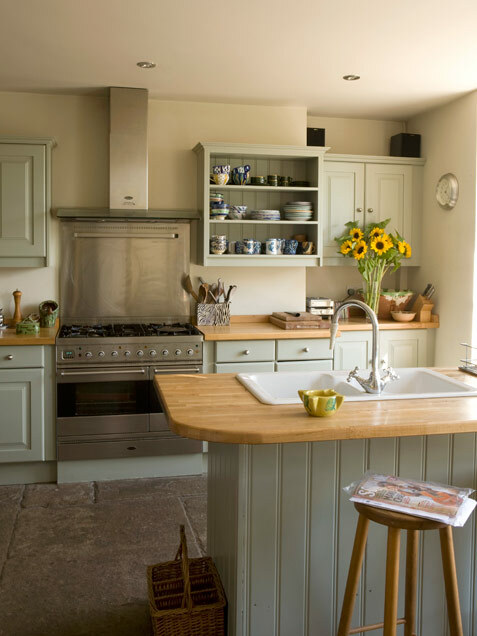 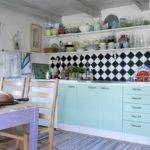 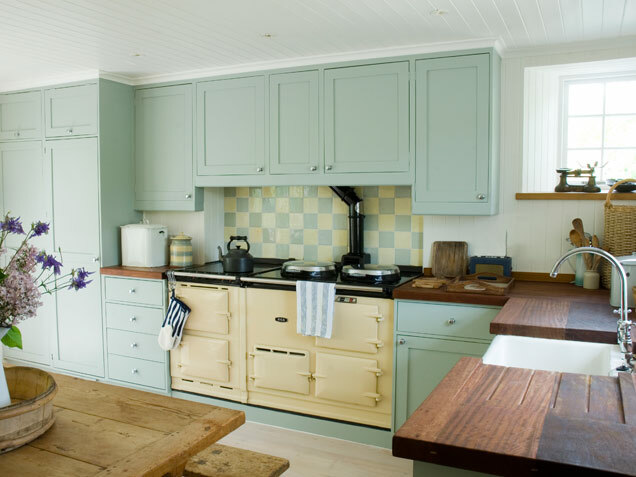 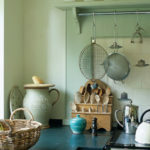 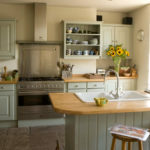 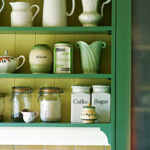 Hint of Mint: Vintage canisters, wooden spoons and a wash of cool green hues keep a kitchen homey. 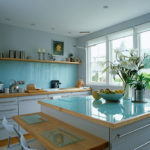 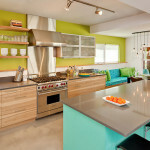 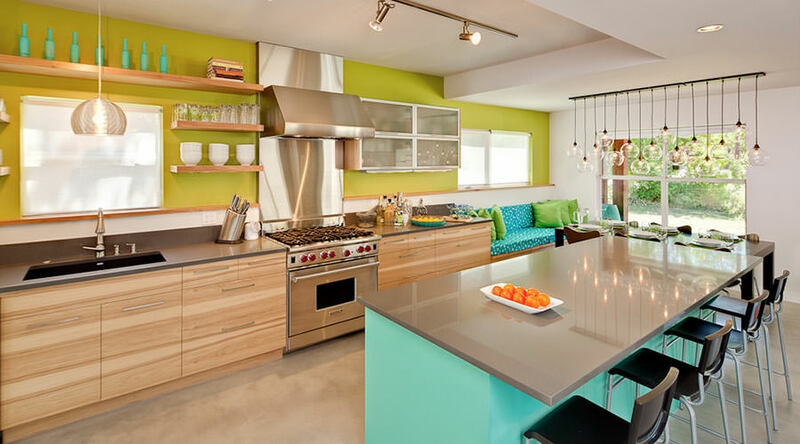 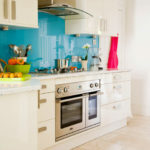 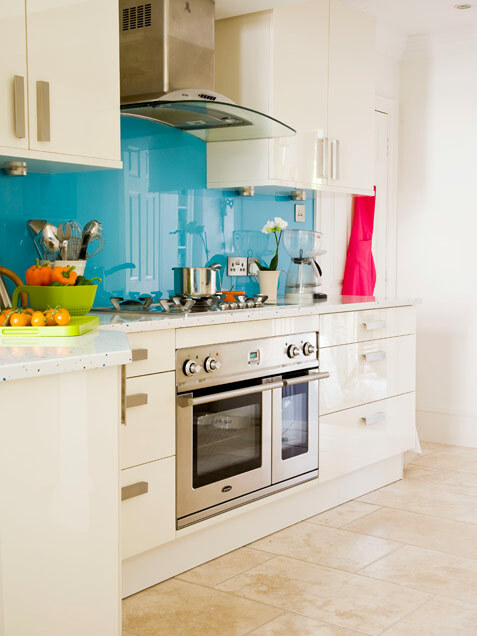 Color Jolt: A bright turquoise backsplash enlivens an otherwise neutral-hued kitchen. 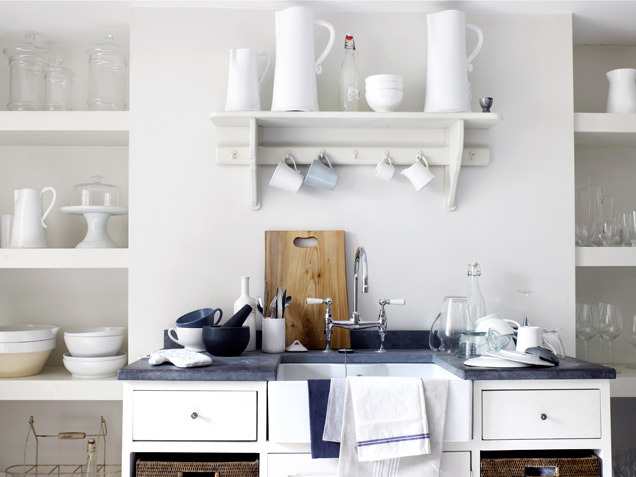 Classic Shapes: Thick white shelves hold glass and ceramic objects with pretty silhouettes. 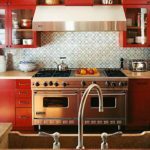 Heavy Metals: A recessed oven area with subway tiles matches the industrial style of the kitchen’s stainless-steel elements. 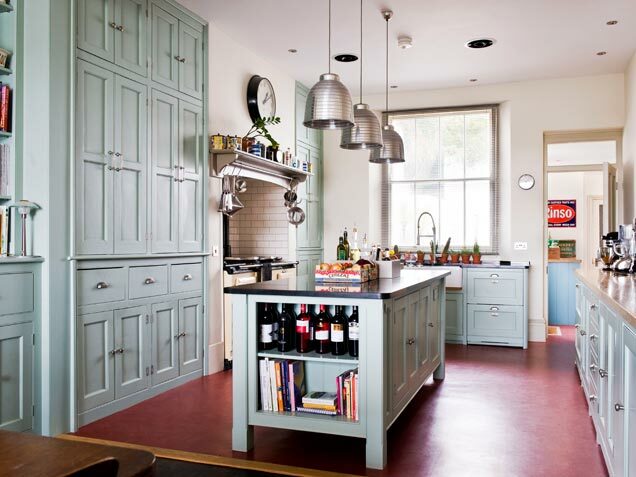 Stunning Storage: When painted icy blue, floor-to-ceiling cabinetry becomes a beautiful focal point. 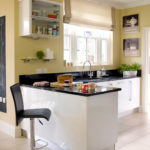 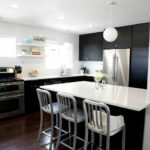 Modern Additions: Black elements, like granite countertops and a leather bar stool, give a soft yellow and white kitchen a metropolitan look. 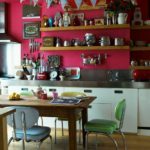 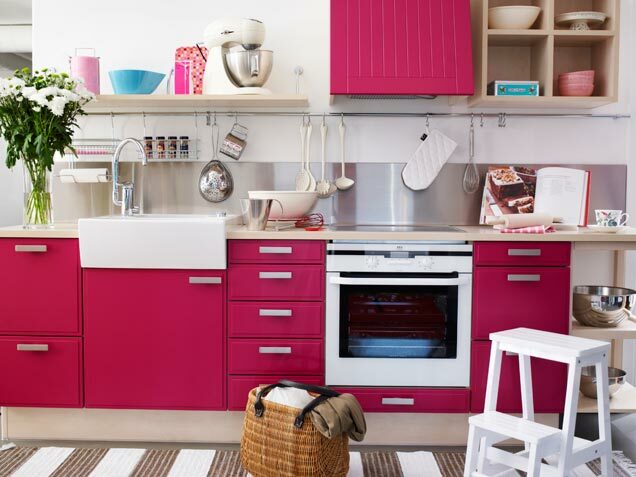 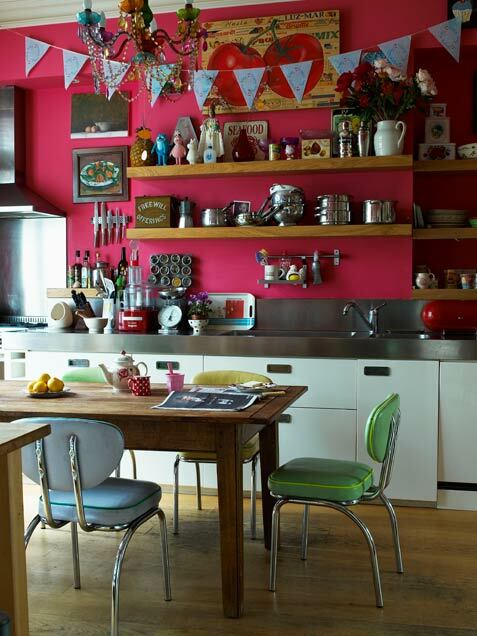 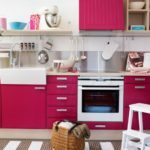 Seeing Red Magenta: cabinets are a bold choice, but the effect is bright and cheerful. 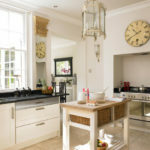 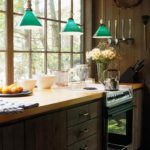 Vintage Touches: Incorporating flea market finds, like enamel tins, a pulley pendant light and an antiqued clock, gives a kitchen quaint character. 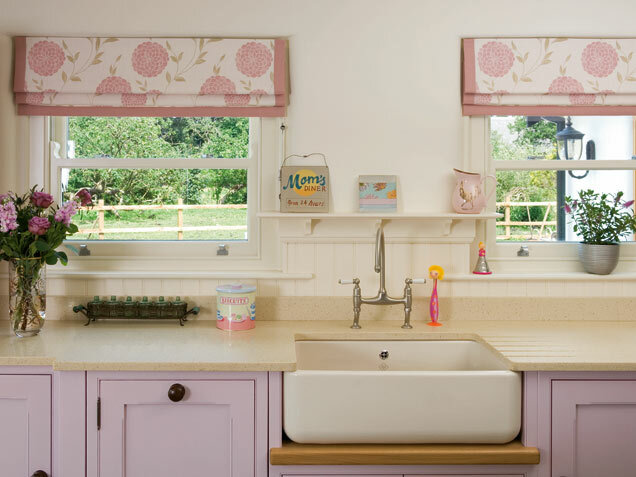 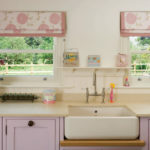 Coming Up Roses: Play up the feminine side of a kitchen by hanging pale pink-and-white wallpaper and displaying rosy-hued bowls. 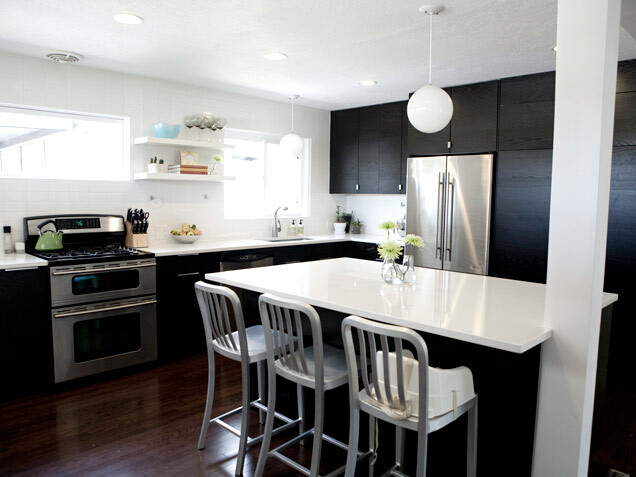 White on White: Dark hardwood floors balance the sleek white cabinetry, molded seating and modern light fixture. 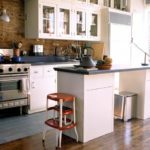 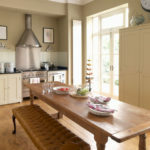 Simple Seats: A pair of retro bar stools offers seating at a kitchen island and can easily be removed during meal prep. 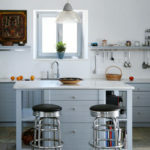 Heavy Metal: Dark cabinets don’t weigh things down thanks to glossy white surfaces and light aluminum chairs. 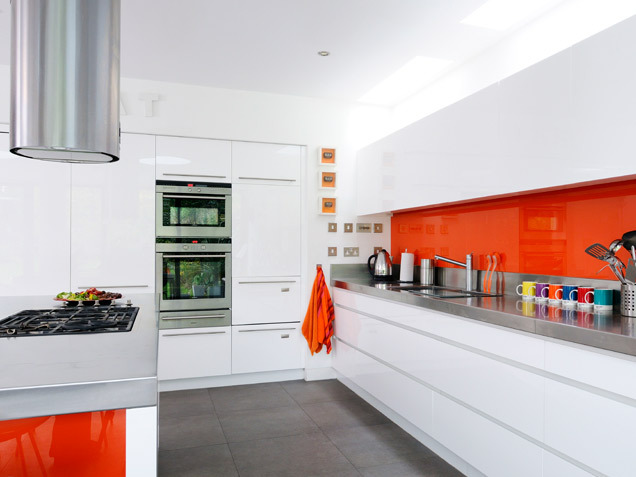 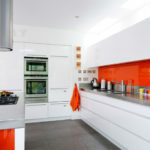 High Gloss: A shiny orange backsplash pops against a sleek mix of stainless steel and white lacquer. 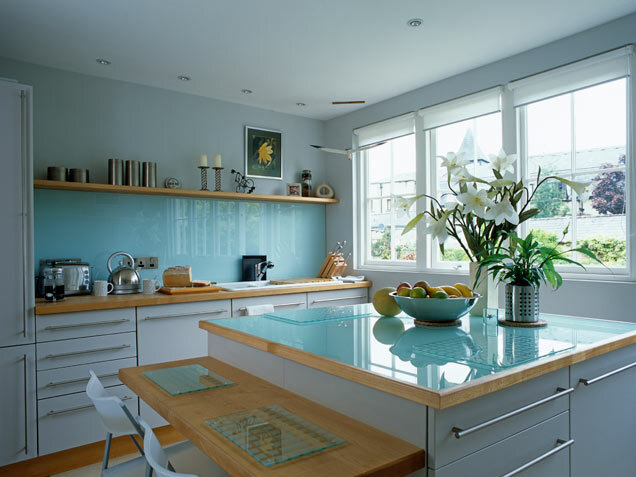 Modern Lines: Translucent sliding glass doors conceal pantry items and blend with a modern kitchen aesthetic. 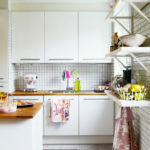 Natural Instinct: Wooden floating shelves and cabinetry blend with white tiling for a clean and homey look. 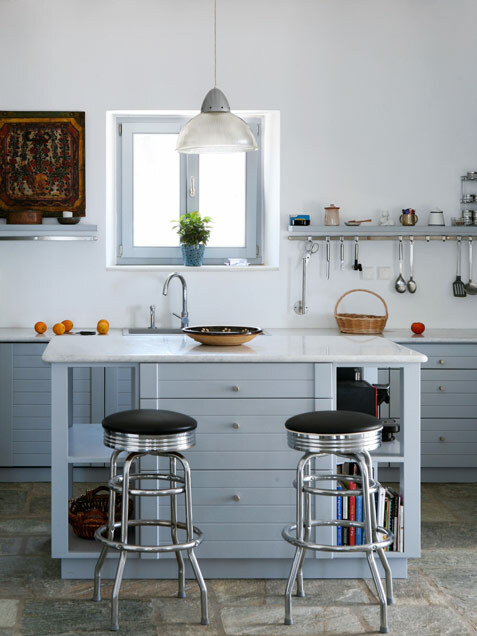 Eat In: A kitchen island doubles as an eating area with stainless-steel bar stools that can be tucked under the island when not in use. 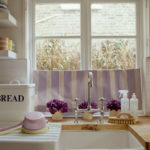 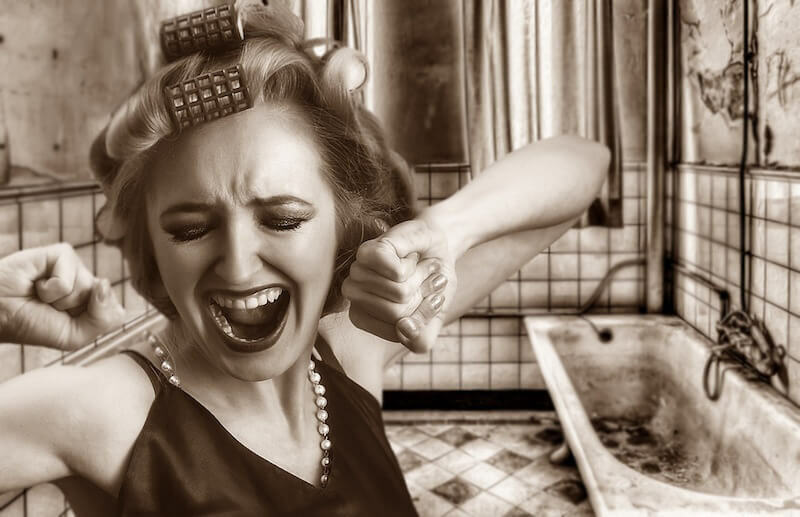 Good Presentation: Keep the sink area fuss-free by decanting soaps and detergents into clear, refillable bottles. 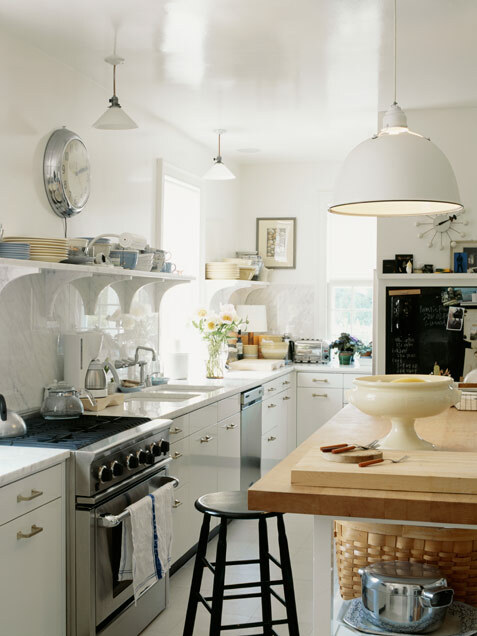 Country Style: An oversized white pendant light helps to anchor a butcher-block island. 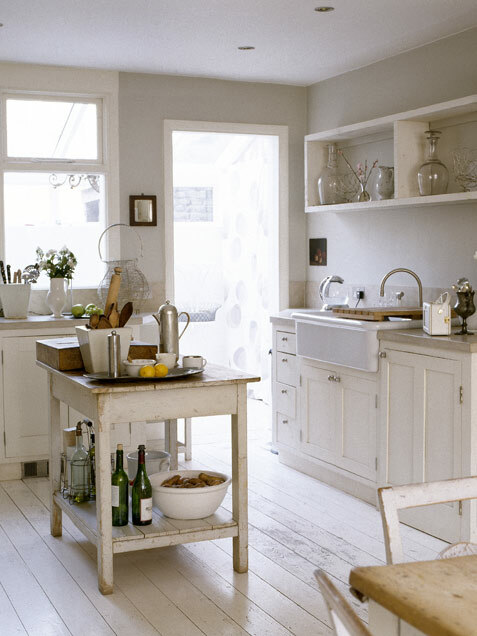 Mobile Unit: A wooden kitchen island with wheels can be moved around a small space as needed. 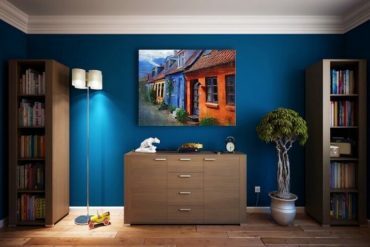 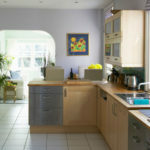 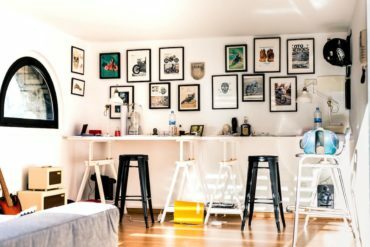 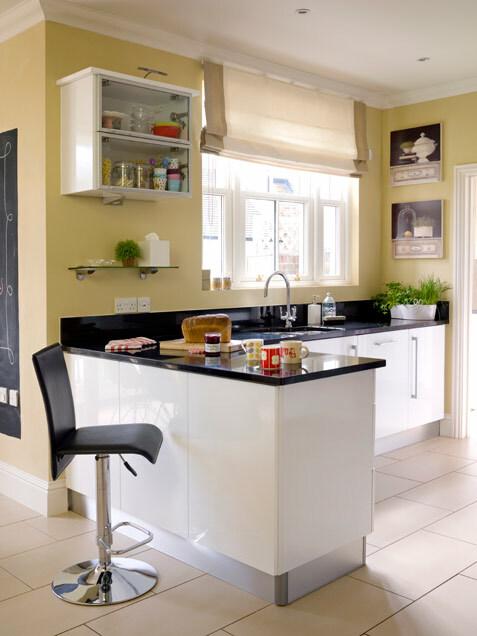 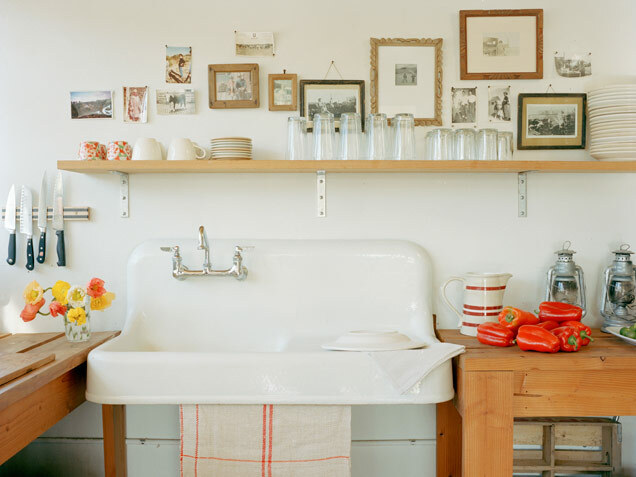 Picture Perfect: Hanging framed photos and artwork above a sink gives a personal touch to an unexpected place. 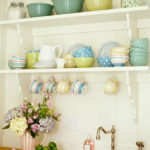 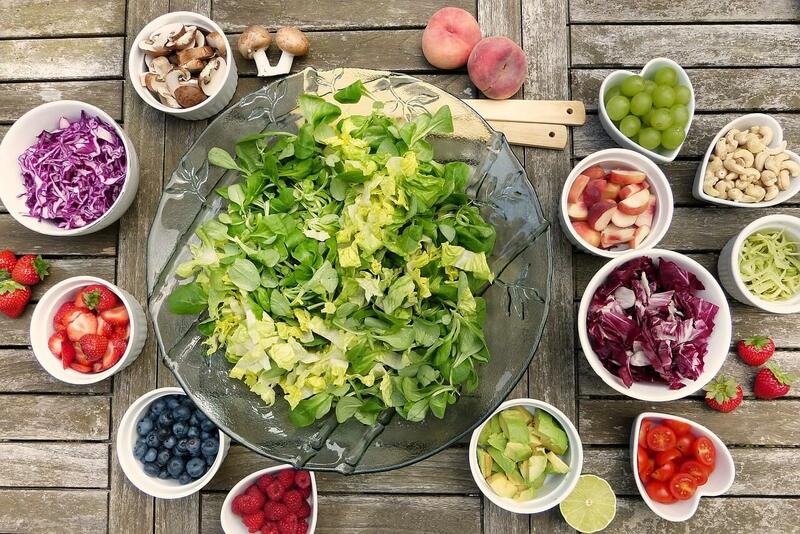 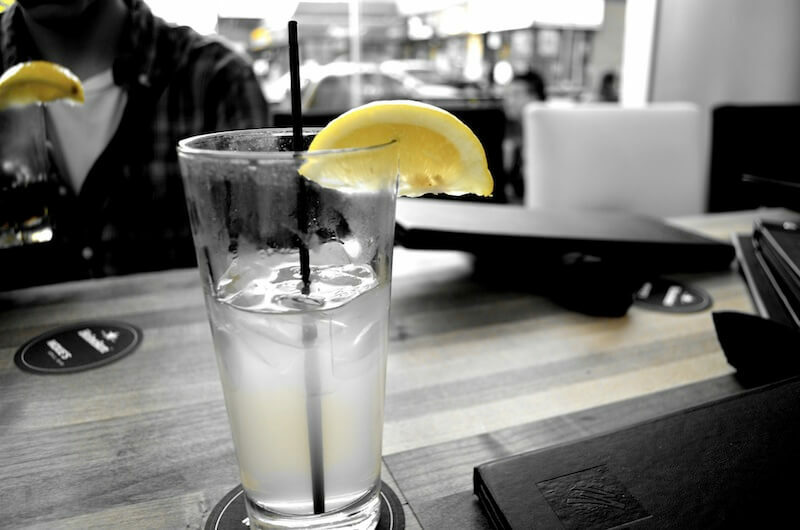 Mix Master: Dishes don’t need to match, but a common palette or pattern will ensure that they coordinate. 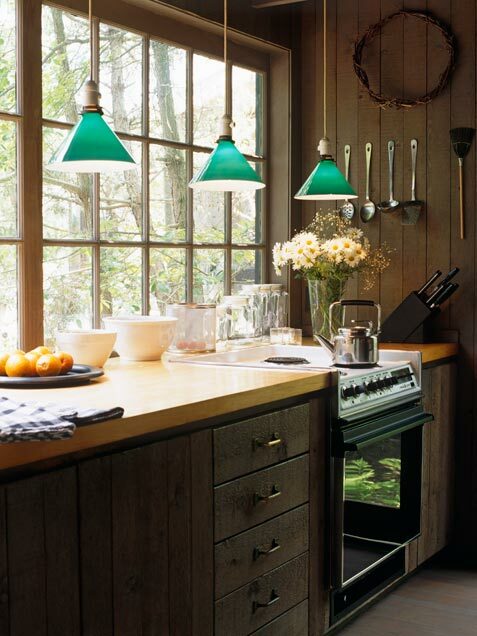 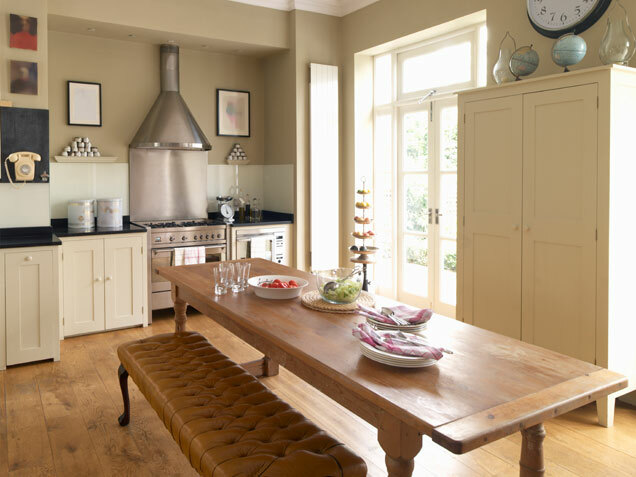 Light Source: Emerald green pendant lights pop against the dark wood of a rustic kitchen. 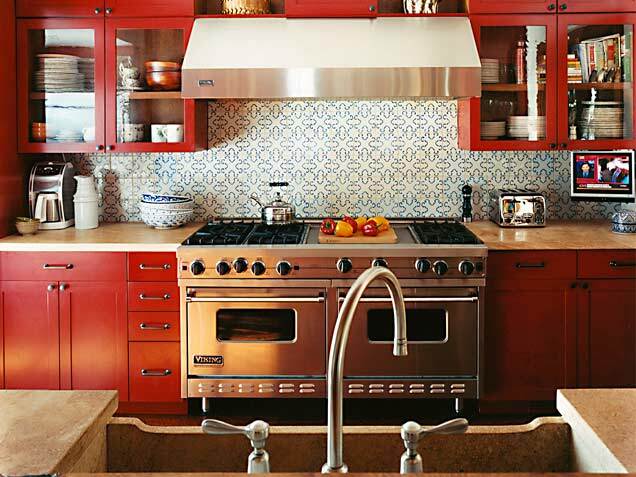 Red Revival: A mixture of colors and materials found in the vibrant red cabinets, patterned tile backsplash and stainless-steel oven create a polished, energized kitchen. 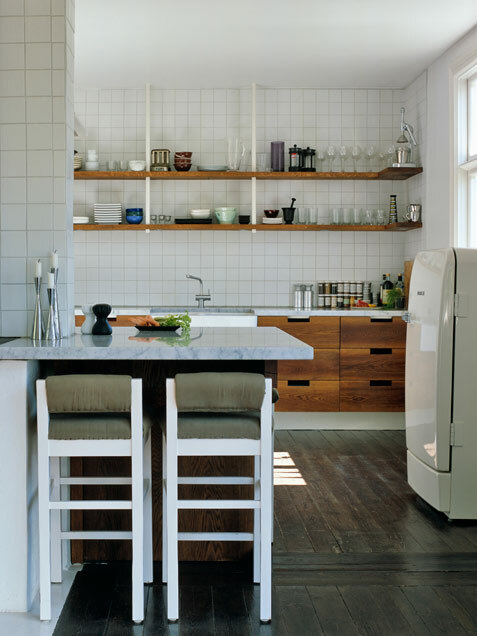 Subtly Contemporary: A combination of birch and stainless-steel cabinetry feels soft and modern in style. 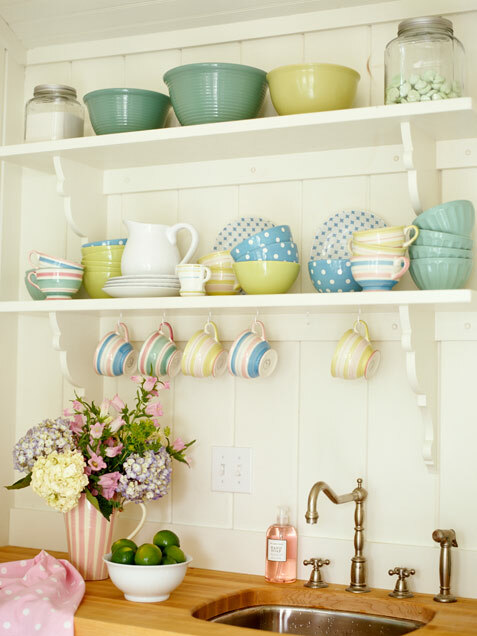 Easy Reach: A wall-mounted hutch provides easy-to-access storage for dishware. 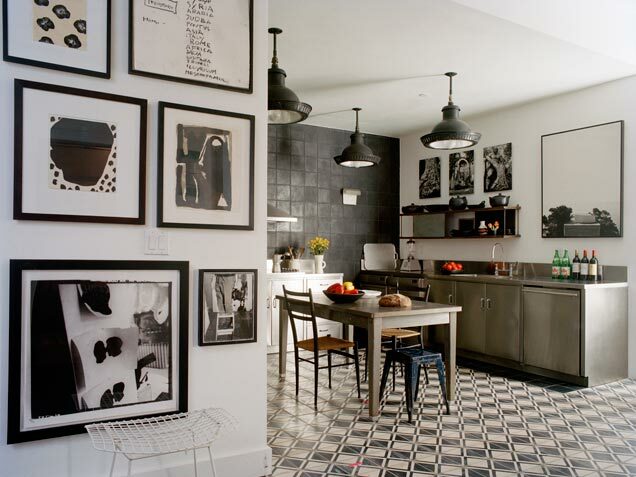 Gridlock: Small white tiling gives this kitchen a linear, orderly look. 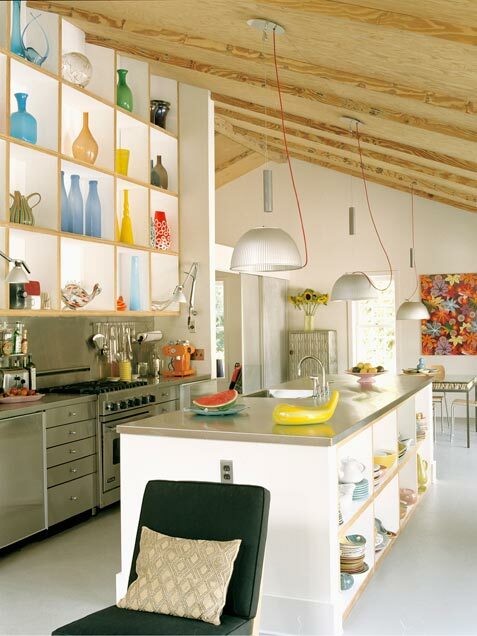 Sky High: Shelving built up to the ceiling creates a grand display for oversized vases. 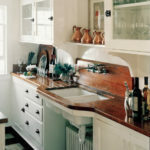 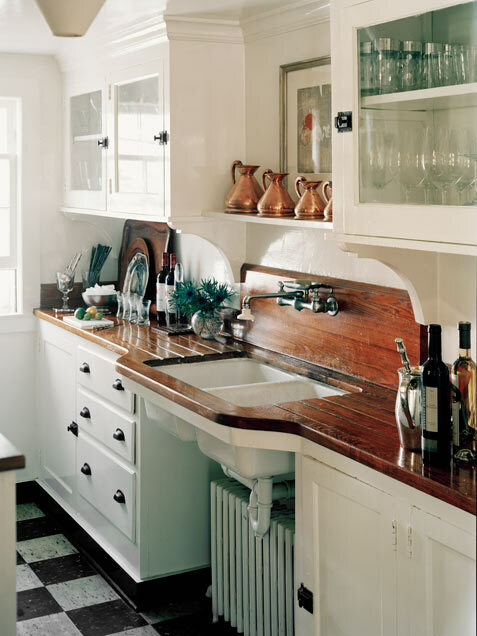 Shipshape: A grooved wooden countertop feels nautical and substantial in a white kitchen. 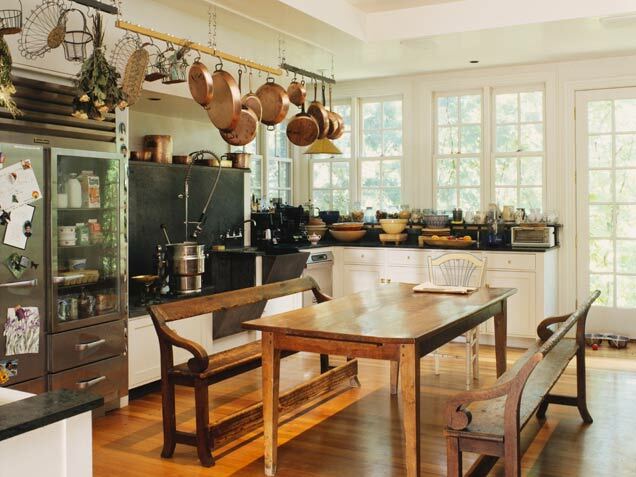 Elevated Eating: A casual farm table gets a lift of formality with a tufted leather bench. 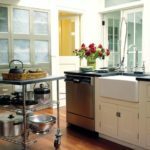 Counter Balance: To make up for limited space, a generous kitchen island multitasks as storage, a table and extra countertop. 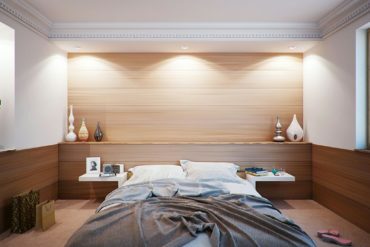 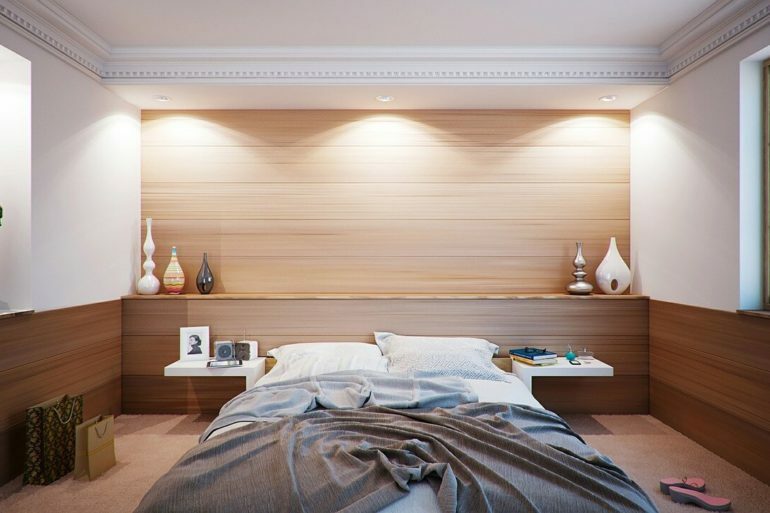 Palette Cleanser: Natural wood surfaces complement soothing pastels. 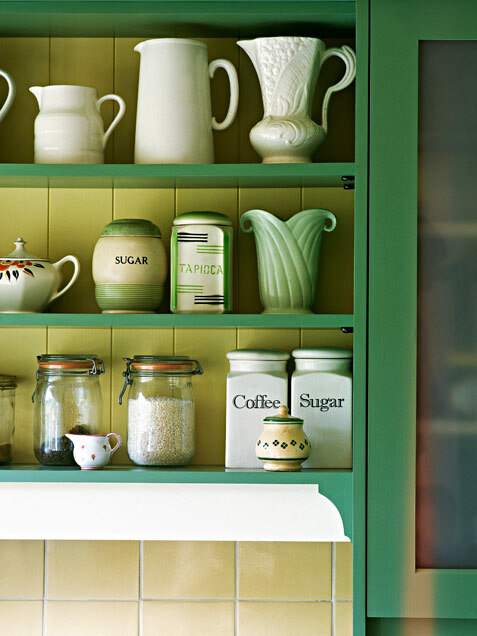 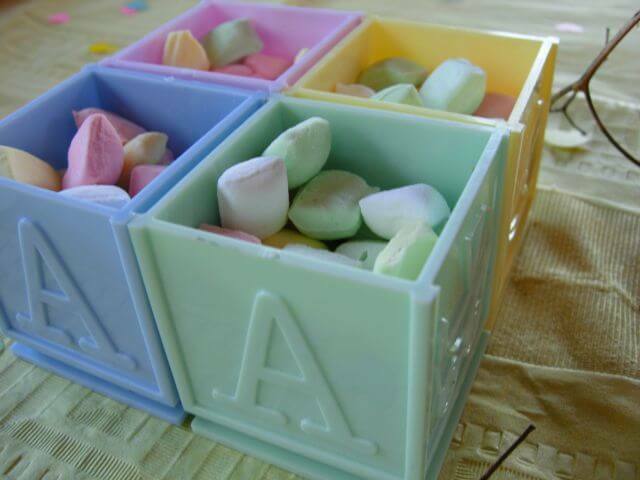 Go Green: A collection of vintage ceramics and mismatched canisters makes an eye-catching display. 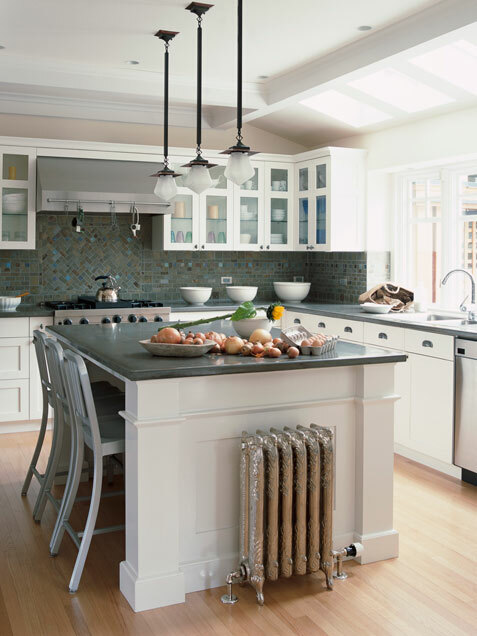 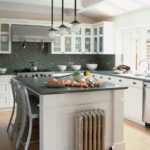 Check It Out: A graphic black-and-white backsplash provides pleasant contrast to cool hues. 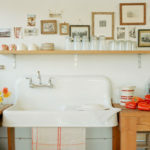 Pipeline: Leaving the underside of a large farmhouse sink exposed makes a unique focal point in the kitchen. 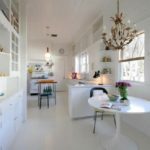 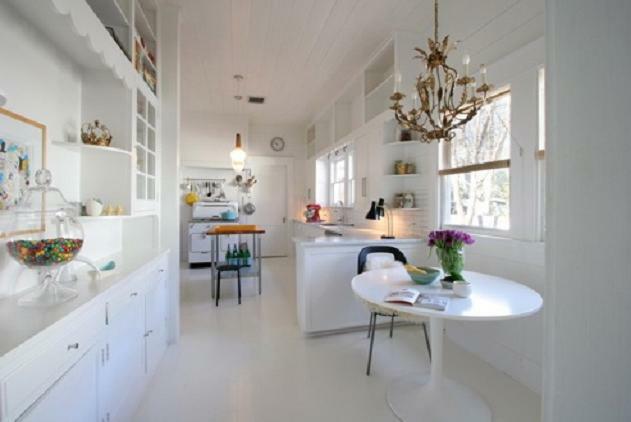 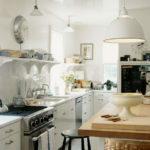 White Wash: An all-white kitchen is pristine and elegant with streamlined midcentury furnishings. 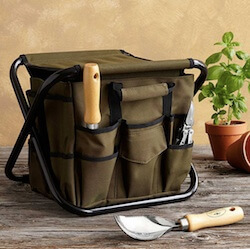 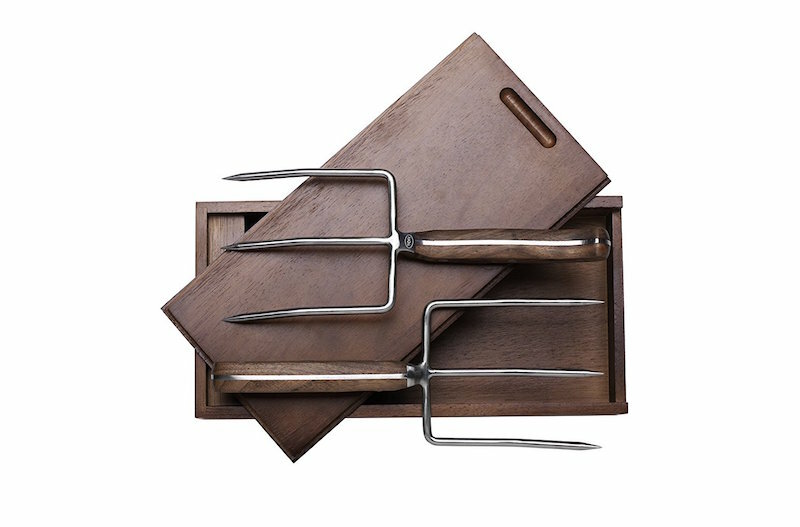 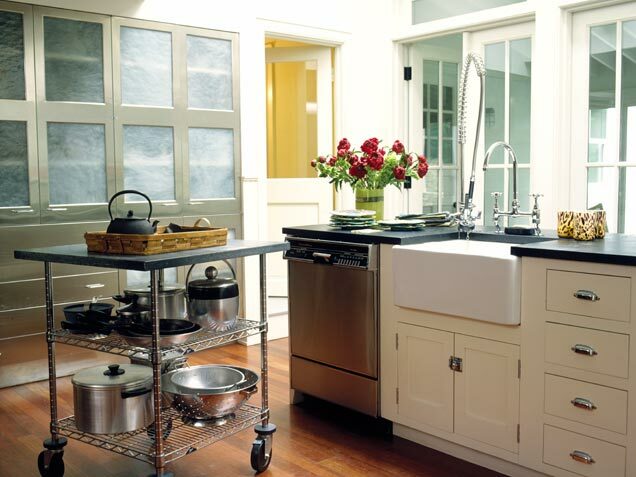 A la Carte: Small spaces require flexible solutions; a portable cart can be used for preparing, serving and storage. 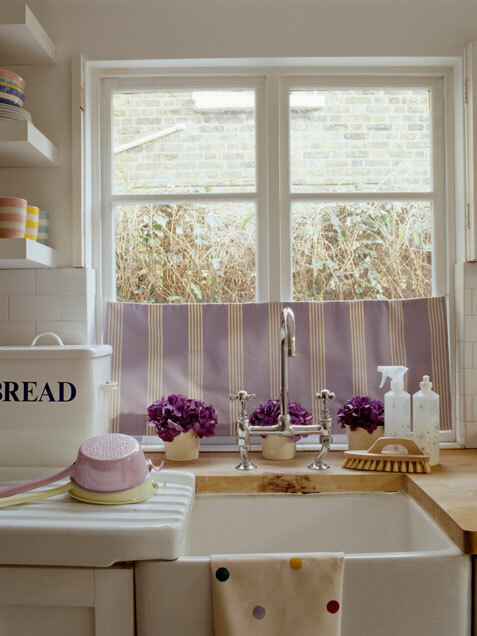 Floral Influences: Delicate feminine touches, like soft lavender cabinets and hydrangea-patterned shades, create a pretty kitchen design. 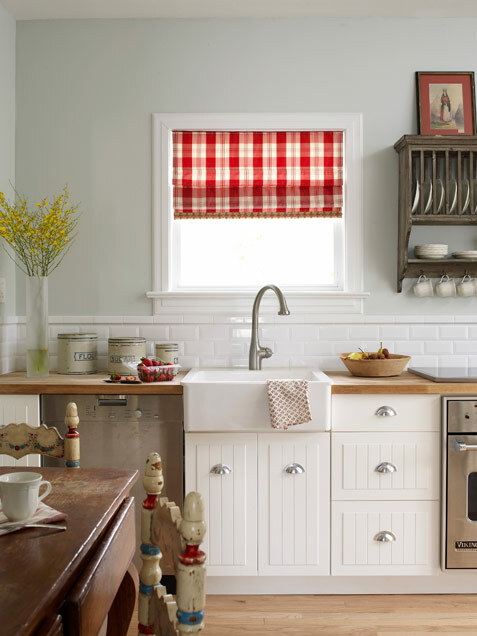 Checked Out: Provincial touches like traditional plaid shades, a vintage table and chairs, and classic country crocks add a homey touch. 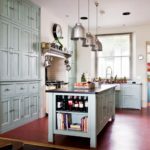 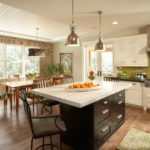 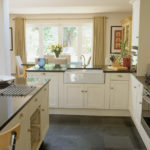 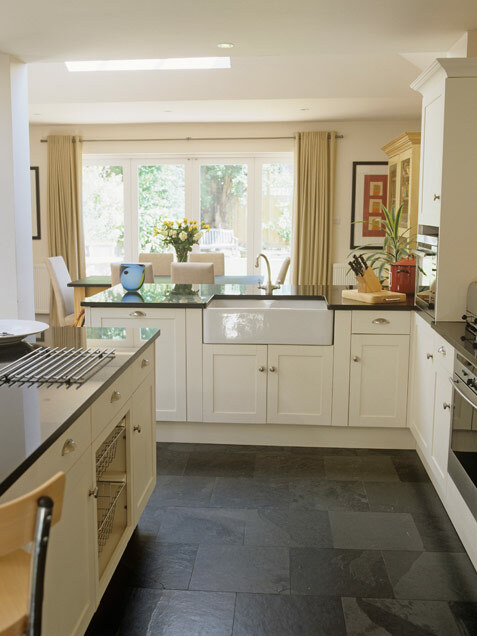 A Clean Slate: Slate floors are perfect for high-traffic areas like kitchens—they’re durable, stain- and moisture-resistant, and hypoallergenic. 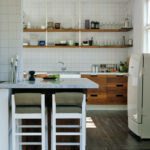 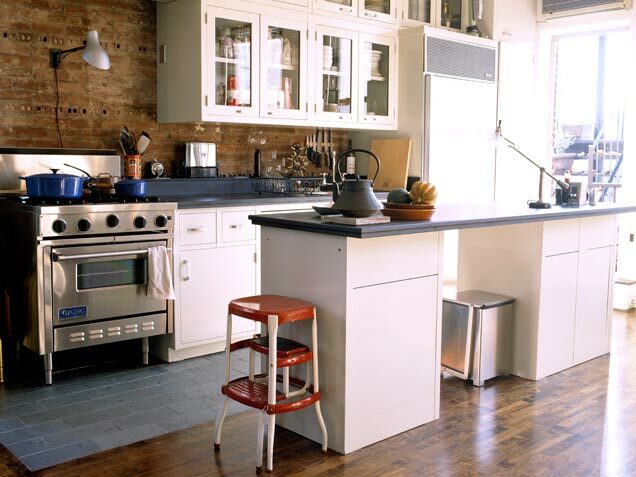 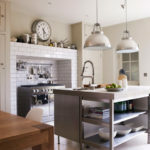 Raw Ingredients: Exposed brick, vintage pieces and a small freestanding range lend this urban kitchenette a retro feel. 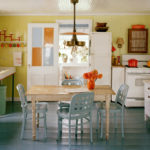 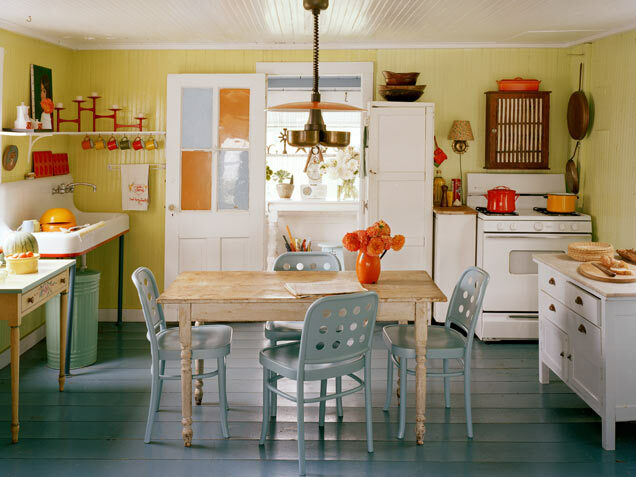 Energized Eating: Cool blue flooring and chairs mix with warm orange accents and walls for an inviting, lively kitchen design. 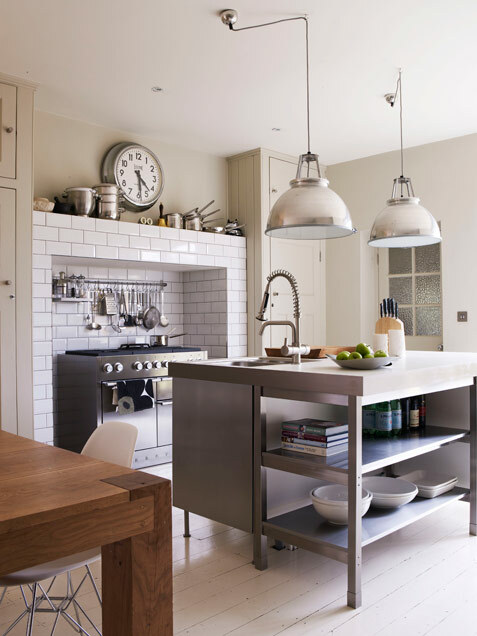 Industrial Strength: Workroom-inspired elements, like a long stainless-steel table and cabinets, will make you feel like a top chef. 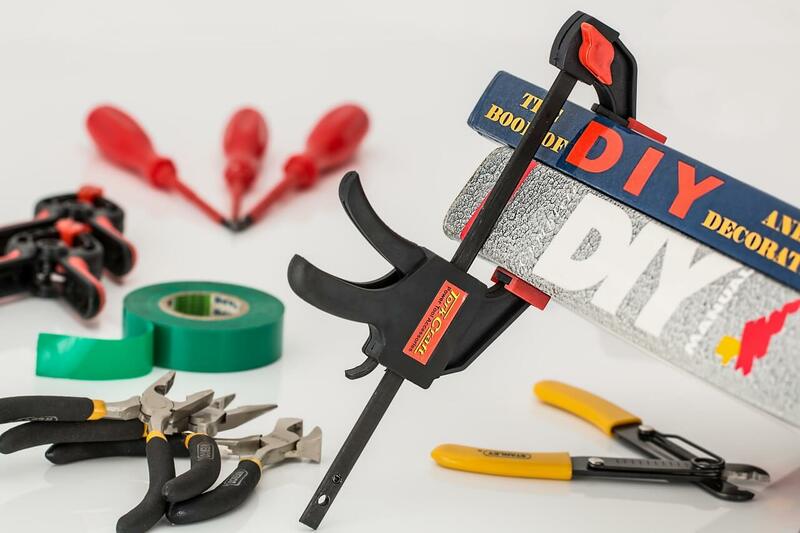 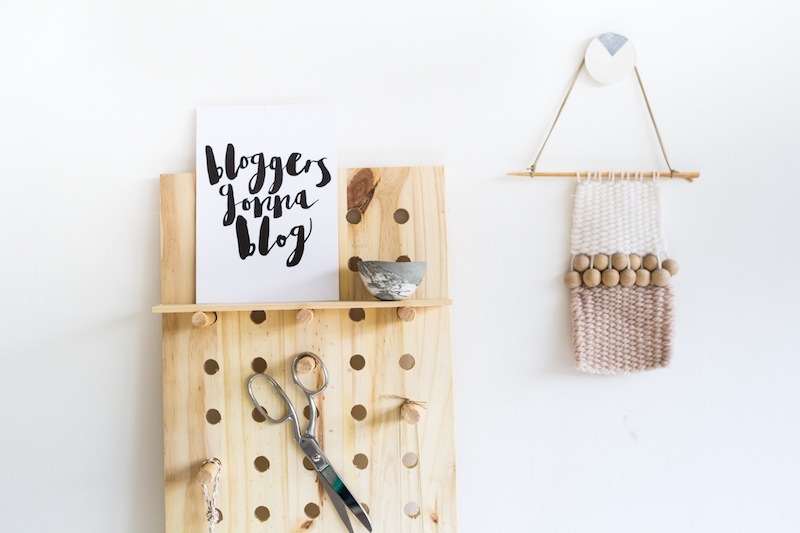 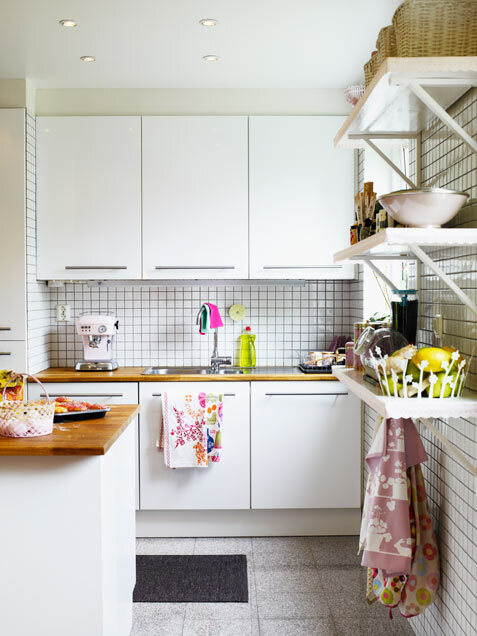 Out on Display: Instead of hiding dishes and pots in cabinets, hang wooden floating shelves on a brightly painted wall and display everything in neat stacks. 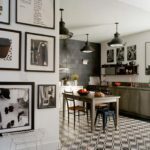 Mixed Materials: Graphic black and white elements, like the framed artwork and tiled flooring, pull together industrial-style cabinets and oversized lighting. 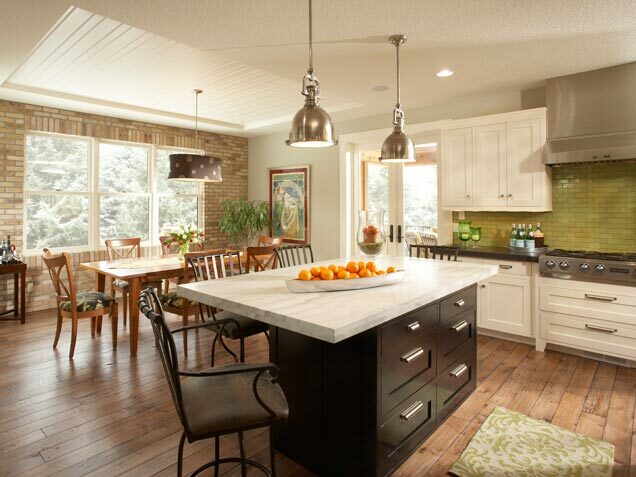 High Style: Make the most of soaring ceilings with oversized cabinets and an eye-catching chandelier. 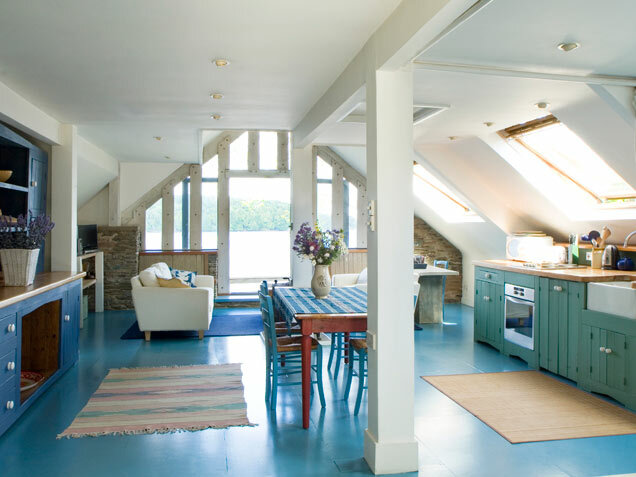 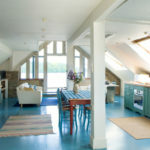 Stay Grounded: Keep walls neutral when painting floors an unexpected shade, like this sea-inspired blue. 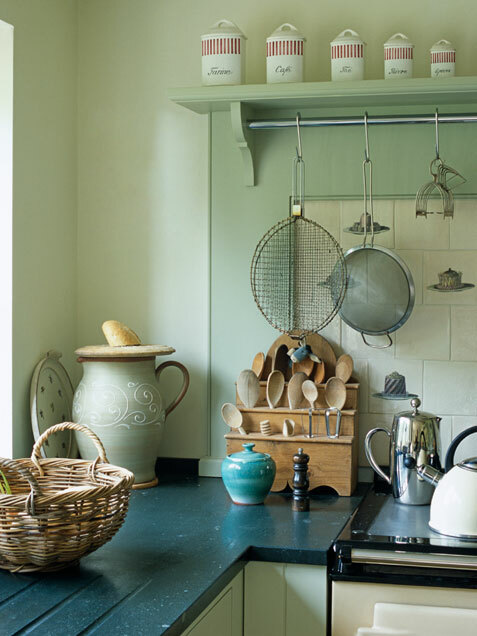 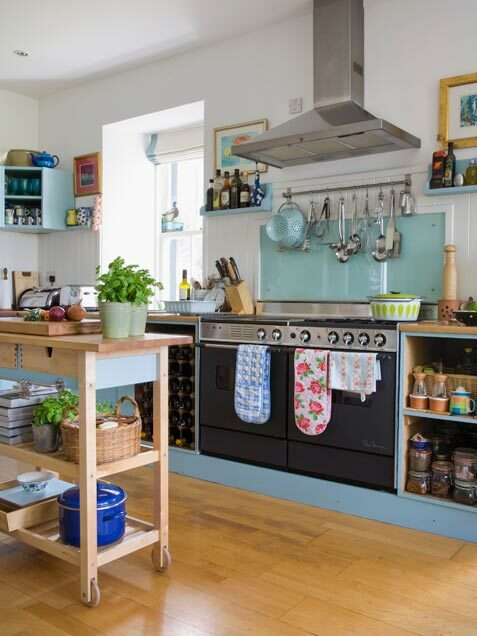 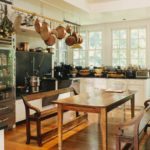 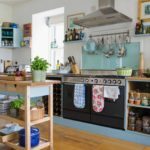 Overhead Storage: When cabinet space is lacking, a long row of ceiling-mounted pot racks creates additional storage space for cookware and baskets. 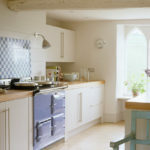 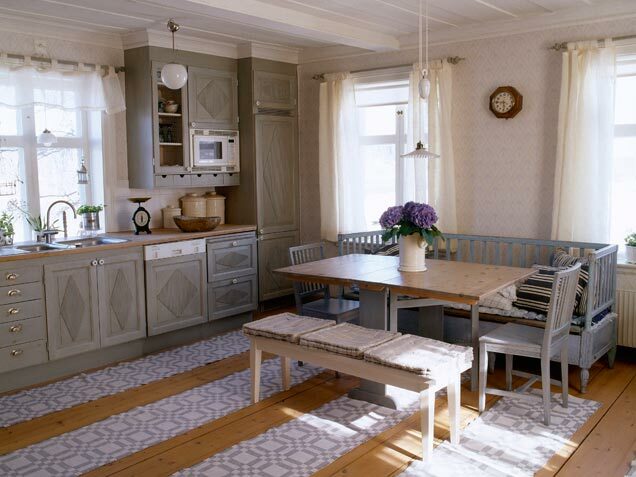 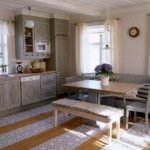 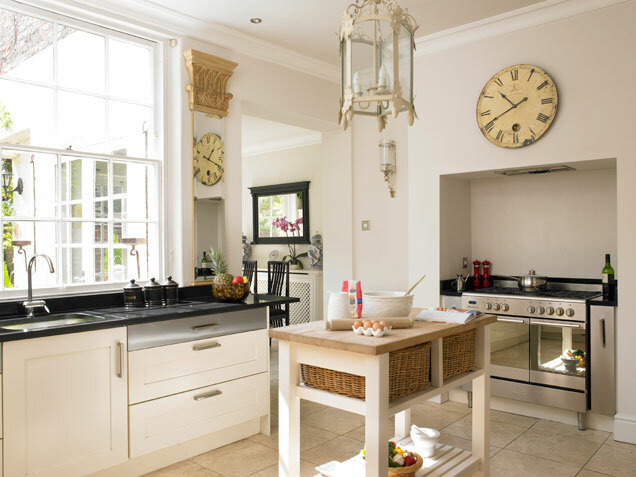 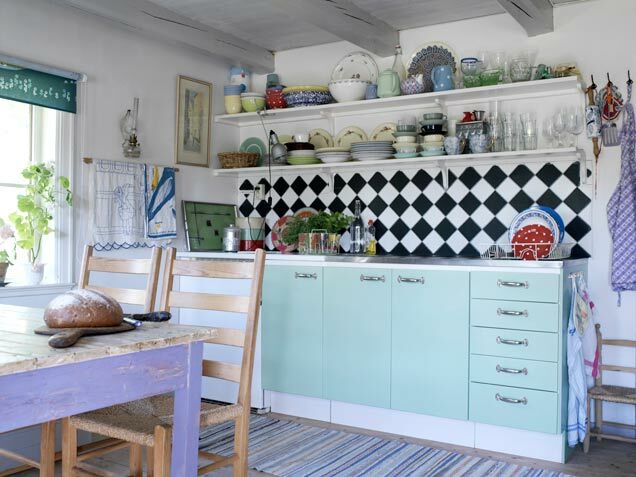 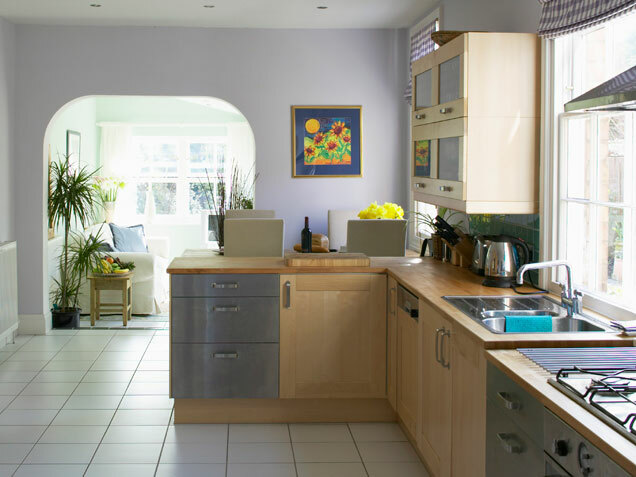 Run with It: The Swedish-style kitchen is excellent with several patterned floor runners.